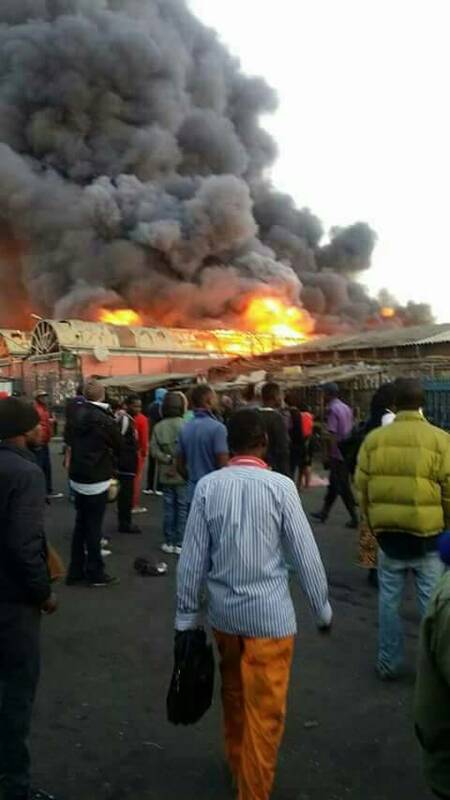 Security personnel apparently angered by politicisation of the defence and security wings and in an effort to compel PF leadership to restore sanity in the nation have claimed responsibility for the fire that swept through the Lusaka City market in the early hours of today leaving millions of goods burnt to ashes. The claims are in agreement with the provisional intelligence report leaked to the Watchdog. They have warned of further ‘unspecified action if ‘stupidity’ is not reversed. They said that the operation was tactfully carried out in a heavily guarded market and laughed at what they called lunacy linking civilians to the arson. They said that Zambia police Inspector General Kakoma Kanganja is aware that there cannot be any civilian who can carry out such an operation and must save the country from total collapse by telling his bosses the truth instead of framing citizens. “We have always waited, thinking politicians will sort out the mess they have been creating but apparently they still make things worse. We cannot have defence and security wings manned and commanded by cadres and worse now we are even getting instructions from PF cadres. We know they didn’t expect this but more unspecified action is on the way,” reads the statement accessed by the Watchdog. They have since demanded that Zambia Air Force commander Eric Chimese and police Inspector General Kakoma Kanganja be relieved of their duties as a way of cleansing their wings. The complained that even when the Catholic Bishops tried to secure peace by calling for dialogue, Edgar Lungu and his minions threw away that chance by insulting the Bishops and that they have been forced to react because Lungu and Pf don’t seem to be remorseful and have doubts of what would be the outcome of the meeting which Lungu wants to have with the Bishops because instead of thanking the clergy, his rank and file has continued mocking and making derogatory remarks. And a provisional report leaked to the Zambian Watchdog says that the act was carried by highly trained military personnel and does not rule out commandos from the Zambia army. “The place is heavily guarded and this is just purely an expert attack that beats the current security set up at the site. At this stage it is not correct to rule out some infiltration within the defence forces, this could come from retired or current saving personnel”. One of the modern markets constructed by Zambian government and managed by the Lusaka City Council – LCC. Has over 4,000 stalls housing traders running small businesses ranging from stationery, groceries, tailoring to small printing companies, secretarial services, meat processing and clothes selling and is home to several bus stations leading to several townships in Lusaka. The market also supports over 30,000 households averaged at 6 members per family. Till it was gutted, it served as market hub, an entrepreneurial centre and most entrepreneurs have benefitted from the market. The market hosted registered and non registered businesses. Market stalls and bus station levies amounted to not less than K20,000 per month but only half that amount was banked by LCC. The market has a designated police station within the premises and is guarded by heavily armed police officers on a 24 hour basis with instructions to shoot upon sight anyone loitering inside or outside the market outside trading hours. Opens at 05:00hrs in the morning and closes at 18:00hrs, by 18:30 security personnel comb the area to ensure that safety adherence is maintained, no one remains inside the market.